This article discusses the characteristics of a lycra swim cap to help you decide if this is the right kind of swim cap for you. It is thicker than a latex swim cap but has about the same thickness as a silicone swim cap. It has a soft, comfortable feel. It can come in a lot of different colors, as is made possible by the lycra fabric. Most often, however, it sports a single color or at most two colors. It has a neutral smell (unlike a latex swim cap for example). It is often more comfortable to wear than a latex or silicone one because it constricts the head less. It is also often easier to put on and to remove and pulls less on your hair. It evacuates the heat better from your head when you swim in hot water. As it is made of the same material than your swimsuit it is possible to match your cap’s and your swimsuit’s color. Its edges don’t stick together when dry, unlike a latex or silicone swim cap. The material is more permeable and protects your hair less from chlorine. It doesn’t keep your head warm if you swim in cold water. It takes more time to dry than a silicone or latex swim cap. 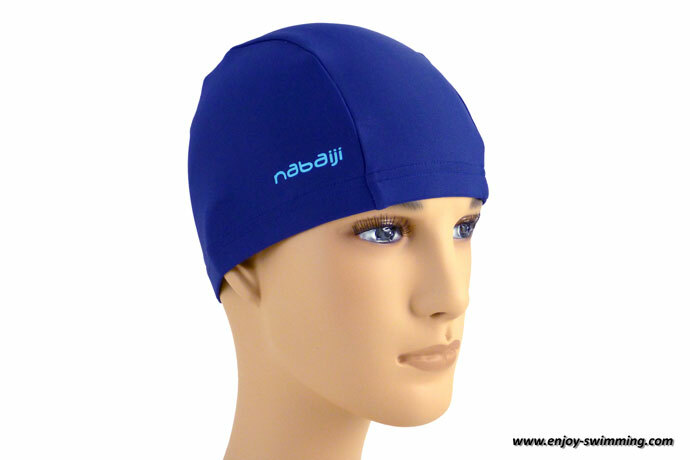 It is more expensive than a latex swim cap (but about the same price as a silicone cap). With time the fabric becomes less elastic, and the cap tends to slip more. Whereas latex or silicone swim caps must often be replaced because they tear, lycra caps often must be replaced because they have lost their elasticity and slip all the time. A lycra swim cap might be the right kind of swim cap for you if you swim in water that isn’t too cold, want to have a swim cap that is comfortable and doesn’t pull your hair, and you aren’t concerned about getting chlorine into your hair. We are looking for lycra swim caps for children, printed by sublimation printing with different designs, created by us. We need to have at first 4 designs each 2.000 nos. Do you know somebody who could do this for us? I’m afraid I can’t help you in this matter, sorry.